After my ode to comfort on Wednesday, this is what I wore to work on Thursday. Still warm and cozy, but a little more put-together. This is one of those outfits that I thought was really great when I wore it but don't really like it after looking back at pictures. Oh well, I felt good when I wore it, which is all that matters I suppose. I bought this sweater on sale at Gap recently without even trying it on because I thought it was exactly what I wanted: neutral, loose-fitting, long enough to wear over leggings. Once I got it home and gave it a test drive, however, I was perplexed by the fit, particularly the enormous neck cuff. I'm not opposed to the boldness of it, but it just gets in the way! I ended up rolling it in half, which just doesn't look right. The redeeming factor of this ensemble? 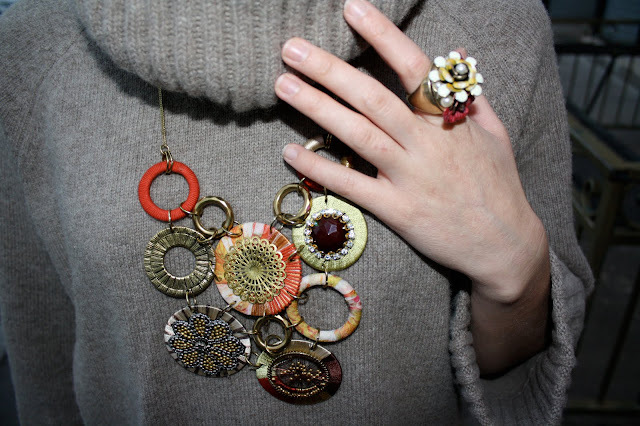 The incredible jewelry, of course! Like Indiana, I too received a very generous package from Accessorize and agree with her that a giveaway is in order! Watch out for one in the next couple of days. The necklace is amazing. Borrow? Such a snug and chic knit, i love it. And i also love that ring! Man, that necklace is incredible. I actually love this outfit. It looks good in the pictures, so I am sure that the awkwardness of the turtleneck was what added to your feeling of lackluster for the outfit. But from another perspective it does look great on you. Those boots really popped the outfit. I recently bought a similar sweater at H & M (more of a cowlneck though) and I've basically been living in it with leggings and boots. It's SO comfortable, and it looks good. I don't think this sweater looks strange, and I didn't think twice about the neck of it. I think it looks great! Also, the necklace and ring are adorable. That jewelry is definitely amazing. I love it! And I love this sweater, crazy neck cowl and all. The oversized boldness just makes it more wintry and cozy. I love this outfit! beautiful necklace! although the neck may be awkward.. that sweater looks super comfy! I love the boots! and that necklace is amazing! i love giant cozy sweaters too. nothing better in early-winter weather. OMG YOU DID IT!!! you look adorable!! hahaha i cant believe you pulled it off. lekisskiss.blogspot.com <-- 2 girls bloggin fashion from ny and chicago! Ah! Your necklace! How fabulous! 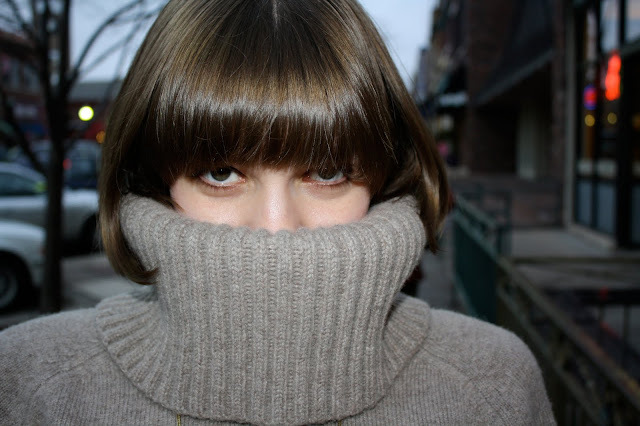 you look amazing that sweater looks great on you,the picture with the collar over your face is stunning. i am sure the collar will loosen off with time,it really does suit you,and is what winter is about! The sweater is so chic! And the necklace is so cool! i have that issue with turtlenecks a lot ... i know how you feel! That sweater looks like the perfect winter top. I absolutely LOOOOOOVE the jewelry paired with it - it looks so cool over the sweater. That is an awesome necklace! I think your outfit is really cute! love all the accessories(necklace+ chain)you are wearing with it. Ooh, your necklace and ring are so special looking. That picture of you with tucked into your turtleneck is cute too! I love the socks :) Very cozy and cute! Can't wait! i hope you are giving away the Union Jack purse. your haircut is so adorable...im still not over it! I actually really like this look. I know what you mean about loving something on and then seeing the pictures and thinking, um, maybe not so much. But this is definitely not the case here! And the jewelry is gorgeous! S.
i have the exact same sweater and i cant seem to figure out how to do the neck either! im thinking the best way is to just fold it in thirds but it still looks silly.